As if we need to be reminded, there is a strong association between Australia's biodiversity, its landscape and ecosystem services such as tourism. It's ironic then, that whilst biodiversity is lost through land-clearing, Tourism Australia has identified "Nature" as the key to reversing a rapidly declining tourism market worth 81 billion dollars per year. 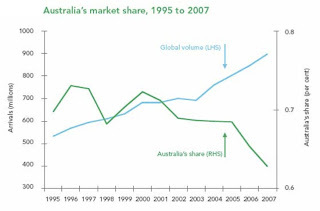 Growth in global tourism (light blue) and decline in Australian tourism (dark green). The Australian National Landscapes program is a national strategic approach, aimed at addressing a "stagnant Australian brand" that, despite being the top country brand in the world for three years running, fails to attract its market share of tourists. To date, the program has identified nine "superlative experiences", aimed at a type of global traveler called the global experience seeker. Experience seekers are well-educated, well-off, informed travelers who seek out real experiences that are unique, generally beneficial and socially engaging. They comprise at least 39% of 38.8 million outbound travelers from the top five countries of the world (Germany, UK, Japan, China and the US). At present, Australia gets less than 1% of this market. The link with biodiversity comes from Tourism Australia's own studies that recognise "nature" as one of the "product truths" behind Brand Australia. It is the one area that sets us aside from our competitors and gives us an edge. Approximately 68% of all inbound tourists to Australia in 2007 (3.5 million) were "nature-based" visitors. Almost half of these participated in three or more nature-based activities during their stay, contributing $27 billion out of the total of $81 billion from the tourism sector as a whole. Tourism Australia believes it can raise these figures by obtaining more than 1% of the global market share. However, if Australia's tourism industry is showing a lack of commitment to nature, would it come as any surprise if we, the general population, had done the same? If we are grossly under-valuing biodiversity in grass-roots tourism, are we making the same mistake when we plan developments? Are we mistaking our own opinion about the value of loss of nature, for the real cost of that loss? For example, the Kimberley is under consideration as one of Australia's National Landscape areas whilst at the same time, the Premier of Western Australia has announced an intention to place a Liquified Natural Gas (LNG) hub on the Dampier Peninsula. Tourism does not prohibit development but one may ask, are the inherent economic, social and cultural values being properly reflected in cost-benefit equations if the local tourism sector is stagnating through a lack of brand-recognition through nature? As ecologists involved in environmental assessment and planning, we need to become much more sophisticated in our ability to work with social scientists and really understand the role of biodiversity (and nature) as an ecosystem service. As discussed in a recent presentation on biodiversity offsets for EIANZ in Canberra, creating a no-net-loss system for development is truly multidisciplinary and must involve a proper quantitative evaluation of social and cultural issues, as a part of biodiversity management. The Australian National Landscapes program is just one, albeit pertinent example, of a study that has valued nature on a national scale. These types of study are fundamental to the role of the environmental profession. Either out of choice or necessity, consultants tend to be isolated from these root issues, whcih threatens to undermine the viability of EIA and Ecological Impact Assessment (EcIA). Perhaps one of the best things that the Commonwealth government could do to help attract more domestic support for sustainable development is to promote biodiversity value to the Australian public, as much as Tourism Australia is promoting biodiversity value to tourism agencies and overseas visitors.